In business since 2009, Bone Dry Roofing's Nashville office is proud to offer industry-leading roofing and gutter services to local homeowners. Our attention to detail, customer service, follow through, and thorough inspections set us apart from the competition. We always get a handle on everything that could be wrong with your roof, and we don't just put on band-aids - we do everything in our power to provide lasting results. Bone Dry, which opened in 1989, now consists of ten offices across six states in the Midwest with our headquarters in Indianapolis. We are the largest roofing contractor in the region. Our office's history here in Nashville has also been one of continual growth and success. We grew out of our Hickory office and into a downtown office in 2015, where we will be able to better serve our customers. If you're looking for efficient, effective roofing services, you've come to the right place! Ryan Linder is currently serving as Interim Branch Manager-Nashville, he has been with Bone Dry Roofing for the past eight years in Indianapolis office, most recently as an Assistant General Manager. He started part-time while in school and has been full-time for the past two years. He has enjoyed the opportunity to spend time in multiple areas of the company; roofing production, masonry production, roofing sales and accounting/finance. This work experience provided Ryan the opportunity to learn many facets of the roofing business. He’s excited to be in an expanded role as a member of the management team. Ryan meets with the production teams and sales team to support their work with Bone Dry customers here in the Nashville area. His favorite part of his job is engaging with customers, meeting them and keeping them informed and ensuring they are pleased with the services Bone Dry is providing to their home. Two other benefits of Ryan role is he enjoys spending time outside and he loves Bone Dry and what it represents in providing exceptional service to our customers. In his free time, Ryan likes to relax and spend time with family, friends and his girlfriend. He’s also a huge move fan! I was most satisfied with their timeliness. We had an emergency situation and they responded quickly. Their serviceman, Sam, was fantastic. I had a great experience with Bone Dry Roofing. They were very professional and handled our roof like it was their own. We were very satisfied with the customer service and communication through out the process. At the end of the project, we scheduled a walk through with the General Manager and signed off on the roof before there was ever a mention of the invoice. We loved the experience and will recommend Bone Dry Roofing to anyone in need of roof work! Because we are such a big part of our community, we enjoy doing all we can to give back to local events and organizations. Some of the charities we support include Habitat for Humanity, United Way, and the Wounded Warrior Project. To find out all of the other community work we do, visit our community involvement page! Bone Dry Roofing has been honored with many awards and certifications over the years because we are dedicated to the highest standards of workmanship and service in the industry. We have an A+ rating with the BBB and we have won several Angie’s List Super Service Awards. 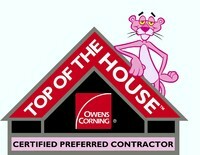 We are also an Owens Corning Roofing Platinum Preferred Contractor, Owens Corning Top of the House Certified, and we have taken their Shingle Recycling Pledge. Without the support of these and other organizations, we would never be able to accomplish everything we do!